Be sure to purchase your tickets in advance. While it might be convenient to just stand in the enormous line to purchase tickets when you arrive at the park on New Year’s Eve, you can save time by visiting the park a day early and standing in the enormous line then. If you have a blog about Disneyland and have a tip to post about buying tickets on the day before New Year’s Eve, be sure to post it sometime before the day before New Year’s Eve. On New Year’s Eve, arrive at least three hours before the park opens. When you get to the parking lot, park your car in line to wait for the lot to open, then get out, go to the drivers of all the cars parked in front of you, and tell them that you just heard on the radio that Disneyland decided to stay closed so cast members could stay at home and enjoy the day with their families. After everyone else has left, you’ll be first in line! 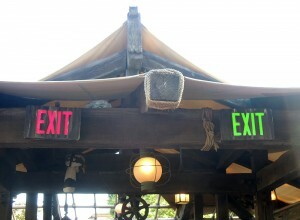 If you are in the park when it reaches capacity, you may not be allowed to return to Disneyland if you exit. This is a good time to ask your in-laws if they will please fetch something you left in the car. Make sure to use the restroom before you leave he house in the morning, and don’t do anything that might cause you to need a restroom until you get back home. 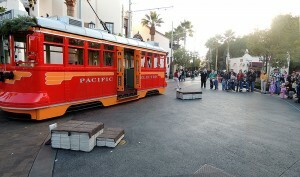 If there is an attraction you particularly want to go on, be sure to go to it immediately when you arrive (even if you have to skip the parking-lot tram and speed-walk to the park entrance to beat the crowds). Lines can get long, but if you go to Space Mountain (for example) right when the park opens, you may be able to ride it as much as twice before the park closes. Plan on standing in a lot of lines. You may want to bring something with you to do while waiting (we like to write our holiday thank you notes or scrapbook). You will be in close contact with a lot of strangers, so practice being friendly. You might want to memorize some interesting Disneyland trivia to entertain those you are forced to stand with for a long time. For example, on New Year’s Eve Disneyland is open from 8 a.m. until 2 a.m., making it the only day of the year when it’s open for negative-six hours. If you think you are going to have trouble getting up early and staying awake until midnight, bring a sleeping bag or comfortable blanket and scope out a nice bench to nap on. Alternately, go on the Winnie the Pooh attraction for a simulation of catching 20 winks. Because restaurants may be crammed, don’t bother trying to eat anything that doesn’t come from a cart. Take in a Christmas parade and enjoy a moment of nostalgia for last week. If you’re interested in purchasing one of the delicious hand-made candy canes from the Main Street candy shop, you’re late. If you are visiting with kids, keep them up late the night before and wear them out as soon as possible once you get to the park. Let them fall asleep, then wake them up for the 8:30 fireworks and tell them it’s midnight. Then go home. At midnight, most guests will be packed into one of the “countdown” locations, so this is a good time to go on a few rides. If you leave right after the stroke of midnight, you can go to Main Street, lift your legs, and just let the crowd carry you out to the tram. It’s relaxing! *In point of fact, many scientists who shun peer review have noticed that there is a statistically significant correlation between New Year’s Eve Disneyland attendance and global climate temperature, but the cause/effect of this statistic has not yet been thoroughly worked out. Disneyland’s Christmas celebration is legendary, but that tradition almost came to a grinding halt in 2009 due to a lawsuit that claimed that the park’s focus on a Christian holiday was a violation of the United States Constitution’s establishment clause. 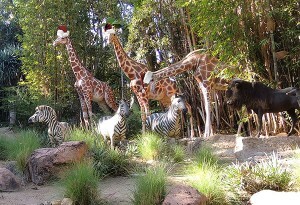 The case was brought to court in November 2009, just after Disney put up its holiday decorations for the season. Not wanting to have to change anything during their busiest time of the year, Disney sought dismissal of (or, at least, a preliminary injunction against) the case based on the fact that the company — despite its massive influence over Congress — was at most a quasi-governmental entity and therefore not subject to the amendment requiring strict separation of church and state. The court did not see Disney’s position as strong enough to prevent the case from going forward. Disney then sought to settle out of court, pointing out that although the park did have many decorations related to the Christian holiday, it also had a window on Main Street with a menorah in it in honor of the Jewish holiday, several windows that were completely bare in recognition of atheism, and both Santa Claus and a focus on the gluttony and commerce of Christmas, which was generally thought to be pleasing to Satanists. This effort was also fruitless. Changing the traditional freshly made candy canes from peppermint to dill. Rumors persist that Disney also replaced the snow that falls during the night-time holiday fireworks with soap bubbles, but this is highly improbable as guests would surely complain about having soap spread on their heads. Fortunately, just before the new year, the court realized that the lawsuit was (in the judges words) “probably the most ridiculous thing ever” and nullified it with prejudice. Since then, Disneyland has gone back to being the Happiest Place on Earth for the holidays, and we couldn’t be more pleased. Disneyland is well known for its holiday attraction overlays, but Disney California Adventure is poised to take some of the holiday spotlight away from its older sibling. 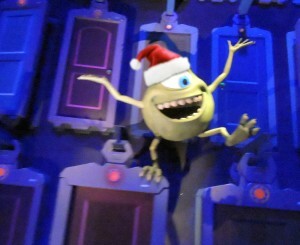 We’re going to have to wait until 2014 for “Santa Soarin’ Over California” and the much-rumored “Tower of Tinsel,” but several more subtle Christmas additions have been made to attractions this year. The ornament-firing game in Midway Mania is probably the most high-profile overlay, and the hint of jingle bells in the California Screamin’ launch noise the most subtle. Our favorite, though, is pictured below. 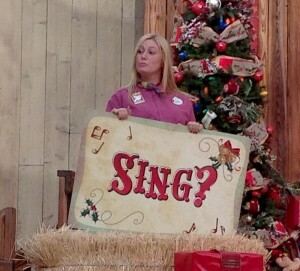 The holiday version of the Billy Hill and the Hillbillies show has a strange addition this year — a passive-aggressive song leader. During certain songs, this cast member stands at the side of the stage and, when the audience is asked to sing along, holds up signs insulting their singing ability. The various reindeer hiding in the bushes throughout the attraction (be sure to visit at night for a better view of Rudolph). 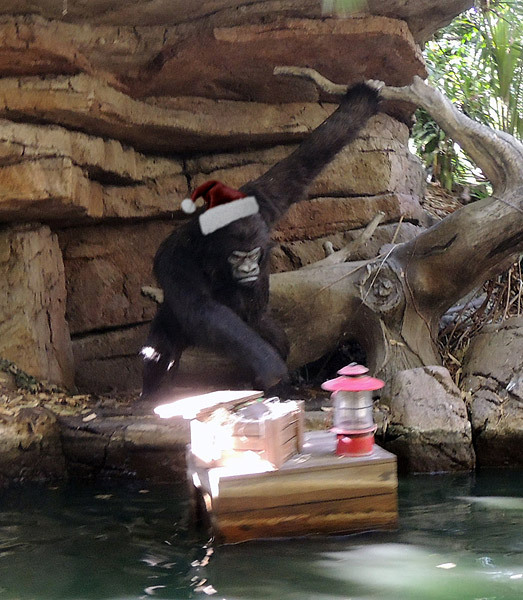 “Santa’s camp” where gorillas tear presents apart next to an overturned sleigh (which explains how all the reindeer got away). The hilarious scene of a rhinoceros with a Christmas angel on the end of his horn chasing Santa and his elves up a tree. The trader at the end of the attraction selling shaved cocoanuts painted to look like Jack Skellington’s head. …who definitely have the spirit of the season! Disneyland spared only a certain amount of expense on this year’s transformation of the Jungle Cruise into the generic-winter-holiday-but-mostly-Christmas-themed Jingle Cruise. Today, we are going to share a few photos of the merriment added to the attraction’s queue, and we’ll show you some of the elements from within the actual attraction in a couple of days. 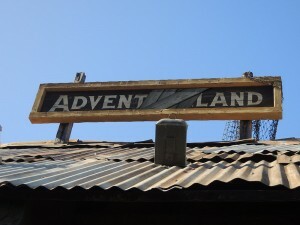 The first thing that many guests will notice is that the Jingle Cruise is not in Adventureland, it’s in Advent Land! It’s amazing how much theming can be done by just nailing up a few boards. Another simple holiday change, the attraction’s upper-level exit lights are now a holiday-appropriate red and green, instead of just the stodgy, Scroogey, legally required red. 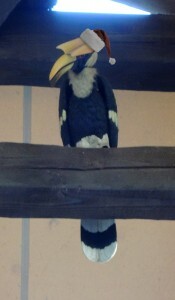 While we’re upstairs, let’s take a look at the animatronic bird above the stairs. 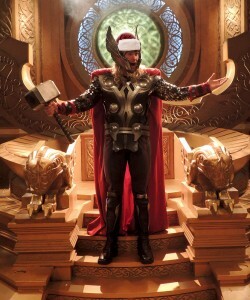 He is certainly ready for the holiday! They’re all addressed as gifts and sport snazzy Albert Schweitzer stamps (named for that famous postal worker, Dr. Albert Stamp). 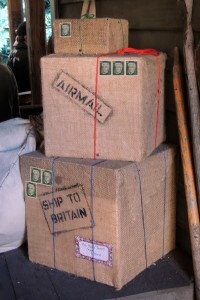 You can even peel back a corner to see the back side of postage! That’s all for now. See you on Wednesday with more photos! 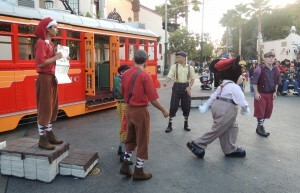 For Christmas, the Red Car News Boys at Disney California Adventure have a whole new show, and we have to admit it was a laugh-out-loud tear-jerking celebration of newspaper-themed holiday goodness! The show starts out with the usual dancing and singing about “current” new items (“Santa Seen at Macys,” “Baby Lindbergh, Home for Christmas?” etc.). 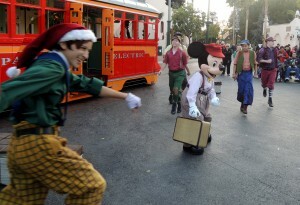 They’re joined by Mickey Mouse who’s traveling home to Toontown to spend the holidays with Minnie and all of their friends. Then things take a dramatic turn. One of the News Boys puts on a Christmas hat, stands on a box, and begins to give a little speech (the same one written for Linus in the old Charlie Brown Christmas special). He’s only a few sentences in when another News Boy declares that Christmas is a time for joy and fun, not speeches. Then he grabs the speaker’s hat and runs about singing joyous holiday celebratory songs! That’s when the show takes a page right out of the script for It’s a Wonderful Life. Mickey and the News Boys disappear, and for ten minutes the audience is left to contemplate what the world would be like without them. It’s an awesome show with a very original punch at the end. Don’t miss it! 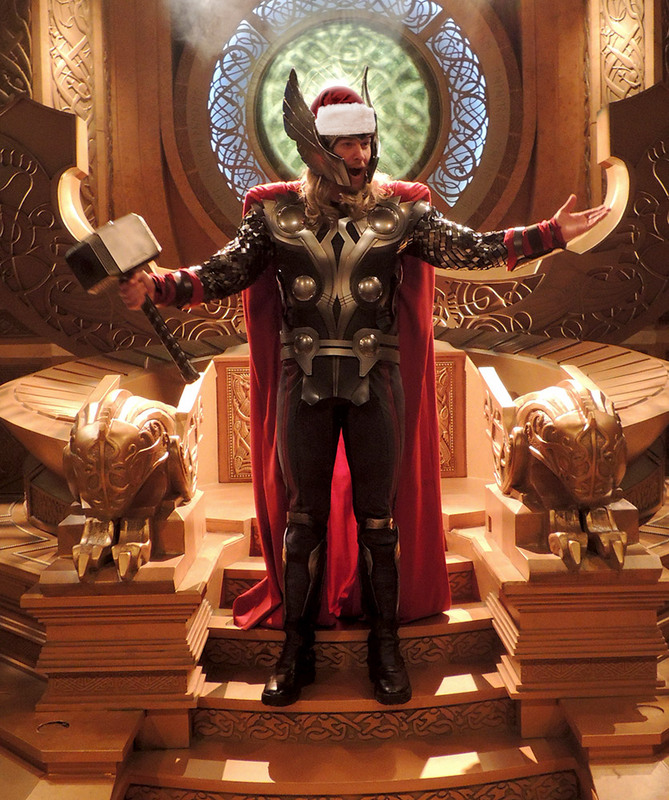 In Innoventions, even Thor the God of Thunder has the Christmas spirit this year! Dear people at DisneyLies.com. You are brilliant and intelligent and I have committed myself to naming all my future offspring after you, but today I am contacting you about another issue entirely. I have a new website called www.wdwvacationhub.com that, despite the name, is intended to act somewhat as a hub of information on Walt Disney World vacations. I am hoping that you could assist me by asking your readers to completely ignore my page as if it didn’t even exist. You see, it is so incredibly full of useful information that I am currently swamped by traffic. Lesson learned: I should have set up some kind of server to handle page requests instead of typing them in by hand, on demand, in real time. Please do not link to my page. That would kind of defeat the purpose. Also, please let me know where to send you a pile of money. We did not take any money from Mike (if that’s his real name), largely because he didn’t actually offer us any. Even so, we are more than happy to pass along the above message as if he wrote it himself. If you have a Disney-related website that you would like us to mention on this blog, please feel free to write to us about it. We can’t say what will happen after that, but we would love to hear from you.